KIEV, Ukraine -- The US is moving forward with over $300 million in security assistance to Ukraine. 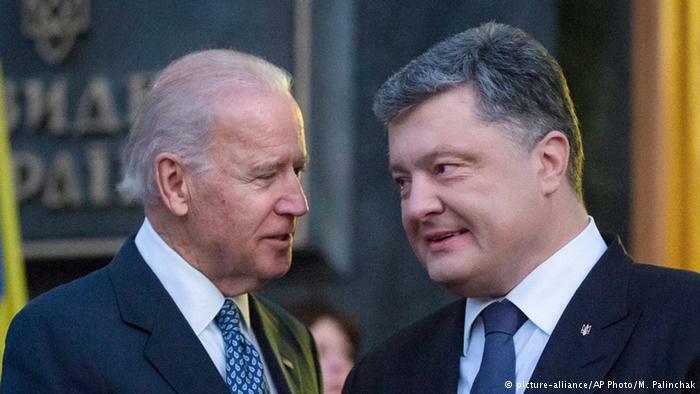 US Vice President Joe Biden (L) and Ukrainian President Petro Poroshenko. The news was tempered by the Dutch prime minister's calls for his countrymen to vote against Ukraine's EU associate membership. According to an official statement on Poroshenko's website, $335 million (294 million euros) will be granted to reform Ukraine's Armed Forces, National Guard and border control. However, Ukraine critically needs to unlock an expected $1 billion from international lenders. US Vice President Joe Biden told Ukrainian President Petro Poroshenko on the sidelines of a nuclear security summit in Washington DC Friday that Kiev's efforts to form a "reform-oriented" government are critical to unlocking this. Biden said Kiev would not receive international economic assistance unless it formed a new government "oriented on reforms and cooperation with the IMF," according to Poroshenko's office. Poroshenko reportedly responded by saying that setting up "an effective anti-corruption system" was his government's priority. While Washington supports Ukraine's pro-Western government, it has also been concerned by corruption in Kiev. The Ukrainian parliament voted to oust prosecutor general, Viktor Shokin, this Tuesday, after US and EU pressure for his dismissal, but many observers don't see Ukraine changing much in the short-term. Kiev relies heavily on financial assistance from the International Monetary Fund (IMF). Having received $6.7 billion from the fund's $17.5 billion bailout package in 2015, the third tranche has now been stalled. Ukraine's economy shrank 9.9 percent in 2015 after a drop of almost 7 percent in 2014, the year Russia annexed Crimea and Ukraine's war with Russia-backed separatists broke out in the east. Ukraine's economy has also been hurt by a trade war with Russia, formerly its largest market for exports, and a drop in the global price of its wheat and steel exports. Since 2014 the World Bank Group has provided a total of over $4.1 billion in budget support, investments and private sector financing to Ukraine. Meanwhile, Dutch Prime Minister Mark Rutte has said Ukraine should not join the EU in the near future. His comments come a week before a Dutch referendum on the association agreement between the EU and Kiev. "We believe that Ukraine should have good relationships with both with Europe and Russia," Rutte told NU.nl. "This cannot be the case if [Ukraine] is in the European Union." Rutte, meanwhile, stressed his support for the association agreement between the EU and Ukraine. After several years of negotiations, Ukrainian and EU leaders signed the agreement in Kiev in March 2014, just after the Maidan revolution. The EU's other 27 states have already voted yes. The Netherlands is the last to vote and most polls show that on April 6th "no" will probably win. In March, President of the European Commission Jean-Claude Juncker said Ukraine is unlikely to join the EU and NATO in the near future. "Ukraine will definitely not be able to become a member of the EU in the next 20-25 years, and not of NATO either," he said in his speech in the Hague on March 3. Kiev's association agreement with the bloc provisionally came into effect on January 1. In order for it to become permanent, the document has to be ratified by each of the EU's 28 member states. A poll conducted by the Dutch television program EenVandaag in January demonstrated that 75 percent of the Dutch voters were against the ratification of the association agreement. The referendum will be held on April 6 and its results will be non-binding for the government.